Hamburg, Germany – The members of the OLED 3D research consortium presented a world first today: the development of large-area, three-dimensional organic light-emitting diodes (OLEDs) and their use in the rear lighting of a vehicle for the first time. This demonstrates the extent to which this new lighting technology will change the appearance of vehicles in the future. The three and a half-year project received € 5.7 million in funding from the German Federal Ministry of Education and Research. The consortium was led by Philips (Aachen) and consisted of Audi (Ingolstadt), Automotive Lighting (Reutlingen), Merck (Darmstadt), and the University of Cologne. The partners aimed to analyze and to improve the technology and the subsequent application of 3D OLEDs in automotive applications throughout the entire supply chain. Together with the Technical University of Darmstadt, Merck developed new, crosslinkable red OLED materials. Thanks to these materials, OLEDs can be produced for the first time in multiple layers on formed glass using wet chemistry. The University of Cologne conducted intensive research on this manufacturing process and demonstrated it on 3D samples. The quality of the OLED substances significantly impacts the lifetime and performance of OLED applications. The sensitivity and precision of analytical chemistry as well as expertise in producing ultrapure materials are thus indispensable preconditions for the successful application of this technology. Therefore, the project also involved intensive work on the purity of the materials used and their chemical characterization. The 3D OLEDs used in the rear lights of the Audi TT were produced by Philips. For this purpose, the OLED manufacturing process, which was previously based on 2D glass substrates, had to be adapted to the third dimension. This related not only to the processes and technologies for manufacturing the glass substrates themselves, but also to vacuum-based OLED coating, encapsulation and electrical contacting. Automotive Lighting developed, realized and tested 3D-supported concepts for the application, mounting and control of large-area, curved OLED components in rear lights. Audi developed an OLED-specific design and integrated the rear lighting into an Audi TT. The impressive design draft shows the multifaceted possibilities that OLEDs offer in external vehicle lighting. The result creates entirely new pioneering design possibilities for innovative OLED lighting applications in automotive engineering. 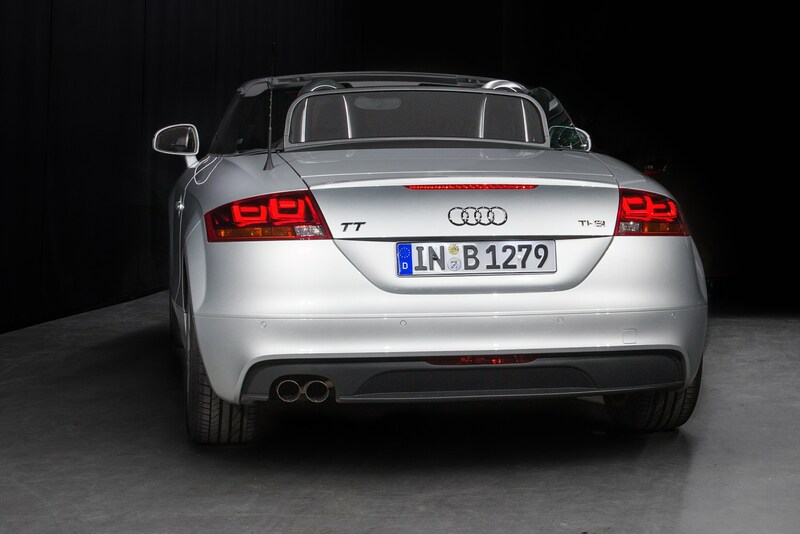 For example, the OLED-3D consortium has further developed the characteristic rear light design of the Audi TT. Using these ultra-thin, large-area light sources, it has entered the third dimension of space and a totally new dimension of design. In 2012, the Audi Group delivered 1,455,123 cars of the Audi brand to its customers, generated revenue of €48.8 billion and achieved an operating profit of €5.4 billion. The Audi Group is globally present in more than 100 markets and produces vehicles in Ingolstadt and Neckarsulm (Germany), Győr (Hungary), Brussels (Belgium), Bratislava (Slovakia), Martorell (Spain), Kaluga (Russia), Aurangabad (India), Changchun (China) and Jakarta (Indonesia). The brand with four rings will produce cars also in Foshan (China) as of late 2013 and in San José Chiapa (Mexico) starting in 2016. AUDI AG’s wholly owned subsidiaries include quattro GmbH (Neckarsulm), Automobili Lamborghini S.p.A. (Sant’Agata Bolognese, Italy) and the sports motorcycle manufacturer Ducati Motor Holding S.p.A. (Bologna, Italy). The Group currently employs more than 70,000 people worldwide, including around 50,000 in Germany. Total investment of approximately €11 billion is planned by 2015 – mainly in new products and sustainable technologies. Audi lives up to its corporate responsibility and has strategically established the principle of sustainability for its products and processes. The long-term goal is CO2-neutral mobility. Automotive Lighting Reutlingen GmbH is one of the international market leaders in exterior automotive lighting. With over 15,000 employees worldwide, we achieve annual turnover of more than EUR 2 billion. Our innovative lighting systems provide a valuable contribution to making driving safer for all road users - by day and by night. We supply to auto manufacturers worldwide, working with them from initial contact to market launch of the finished vehicle. Both our headlight and taillight product ranges combine attractive designs and top technical performance. From halogen to xenon to full-LED headlights, and from simple to very high-quality taillights, Automotive Lighting offers the right solution for every automotive manufacturer. Because in the end, exterior automotive lighting is a key part of a car’s overall appearance. Merck is a leading pharmaceutical, chemical and life science company with total revenues of € 11.2 billion in 2012, a history that began in 1668, and a future shaped by approximately 38,000 employees in 66 countries. Its success is characterized by innovations from entrepreneurial employees. Merck’s operating activities come under the umbrella of Merck KGaA, in which the Merck family holds an approximately 70% interest and shareholders own the remaining approximately 30%. In 1917, the former U.S. subsidiary Merck & Co. was expropriated and has been an independent company ever since. The University of Cologne has been involved in the field of organic electronics for years. The workgroup headed by Professor Klaus Meerholz enjoys a high reputation on an international level, for example for its work on cross-linkable organic semiconductors for the implementation of solution-processed multilayer stacks and on lithographic structures (e.g. RGB pixels). The group also does leading work in the area of highly efficient polymer OLEDs. The Meerholz workgroup has participated in several German Federal Ministry of Education and Research (BMBF) and EU projects in the past and continues to participate in such projects today, and in 2008 was awarded the BMBF innovation platform “Solution-Processed Organic Electronics”. In 2010, Professor Meerholz received the Innovation Award of the German federal state of North Rhine-Westphalia. In 2012 he became chairman of the board of COPT.NRW e.V. (Center for Organic Production Technologies in North Rhine-Westphalia).